Bradley Cooper's new film Adam Jones has been causing chaos in London’s Leicester Square this week. Filming is underway in the capital and will see Cooper take on the role of Adam Jones as he teams up with director John Wells. However, the filming has been causing some problems and has led to people being late for work. A source told the Daily Mirror newspaper: “People who go to work in the area have been complaining about producers telling them they can’t walk in certain places as they keep reshooting scenes of Bradley in the street. "It’s making people late for work and tempers have been lost. At first it was just exciting to have Bradley in the area. Now it’s just a hassle." A terrific cast has been assembled for the film as Cooper is joined by Jamie Dornan, Uma Thurman, Lily James, Emma Thompson, and Sienna Miller. 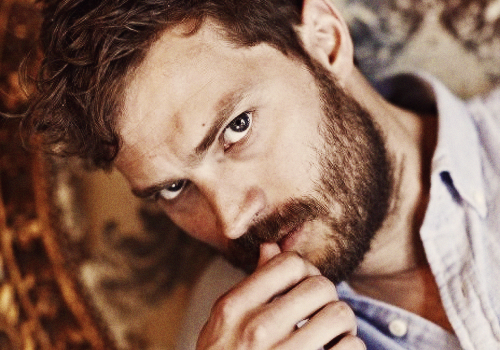 Jamie Confirmed for ‘Adam Jones’! Jamie confirmado para "Adam Jones"! THR - The Weinstein Co. recently changed the name of the film, which also stars Sienna Miller, Daniel Bruhl and Emma Thompson, from "Chef." THR - The Weinstein Co. ha cambiado recientemente el nombre de la película, que también está protagonizada por Sienna Miller, Daniel Bruhl y Emma Thompson, de "Chef". Uma Thurman ha firmado para unirse a Bradley Cooper y Sienna Miller en The Weinstein Co. 's Adam Jones, que acaba de iniciar su rodaje. La película, que se tituló originalmente Chef, sigue a un chef de estrella de rock (Cooper), quien es conocido por su estilo salvaje y creaciones de explosiones de sabor. Con la esperanza de aterrizar en su propia cocina y esa elusiva tercera estrella Michelin, necesitará lo mejor de lo mejor de su parte, incluyendo a la hermosa Helene (Miller). Daniel Bruhl, Riccardo Scamarcio, Emma Thompson, Lily James, Omar Sy, Jamie Dornan, Sam Keeley, Sarah Greene y Alicia Vikander también protagonizan. La película, dirigida por John Wells, pasará dos días de rodaje en Nueva Orleans antes de continuar en Londres del 27 de julio al 26 de septiembre. Stacy Sher, Michael Shamberg y Erwin Stoff están produciendo el proyecto, y Sellers Dylan, Julie Rapaport y Negeen Yazdi están supervisando la producción de The Weinstein Co.
"Cooper will play the title character, a genius cook who returns to London to revive his career and attempt to win a third Michelin star after a period of detoxifying away from the kitchen. Steven Knight wrote the script for the film - which was originally titled ‘Chef’ - and filming is to begin in London under the direction of John Wells in the next few weeks. Sienna Miller will play a sous chef in the new Bradley Cooper film Adam Jones. Cooper plays the title character: a genius cook who returns to London after a period away from the kitchen, detoxifying. Now he wants a third Michelin star, and assembles an A-list line-up to help him. Many of the actors spent a day with Marcus Wareing at his two Michelin-starred Marcus restaurant at the Berkeley in Knightsbridge, to prepare for their roles. Adam Jones, which has a script by Steven Knight, will start filming soon, in and around London. Director John Wells and his casting team, with help no doubt from producer Harvey Weinstein, have gathered a cast that includes Emma Thompson, Daniel Bruhl, Riccardo Scamarcio (Italy’s answer to Brad Pitt), Lily James, Jamie Dornan and Alicia Vikander.